According to the Media Dynamics publication Media Matters, the average person is exposed to an average of over 600 advertisements each day. Whether we are watching TV, browsing the Internet, or driving to work, we are constantly being bombarded with advertisements. We are exposed to so many advertisements that we have become numb. If at the end of the day you tried to recall all of the advertisements you had seen that day it is unlikely that you could name more than 10. Advertisers have the seemingly impossible job of standing out amongst the massive crowd and capturing our attention. One way that many have been successful in doing this is with vehicle wraps. 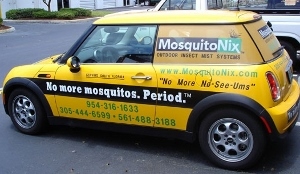 • At $0.77/1000 impressions, vehicle wraps are by far the most efficient form of advertising. • Alternatively, a 30 second television prime time spot costs about $17.78/1000 impressions. • The Outdoor Advertising Association conducted a survey that revealed that 30% of outdoor mobile advertisement viewers would base a buying decision on what they see. Not only do vehicle wraps deliver an impressive quantity of impressions, they deliver a much better quality of impression as well. People are simply not as jaded to vehicle wraps as other types of advertising. Unlike other forms of advertisement, vehicle wraps are not seen as annoying or inconvenient to those that are exposed to them. In fact, they are generally welcomed and thought of as interesting, something that cannot be said for nearly any other form of advertisement. Vehicle wraps cut through the noise, they aren’t met with rolled eyes, and they provide an unprecedented value. In a world oversaturated with advertisements, vehicle wraps provide an excellent and affordable alternative to traditional forms of advertising.